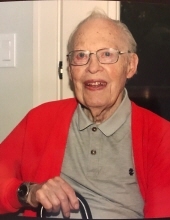 Harold Eldridge McCarville, 93, passed away Wednesday, January 16th, at the Iowa Jewish Life Center in Des Moines. Harold was born on October 3, 1925, in rural Howard County near Cresco, Iowa, the first of four sons of Hazel and Raphael McCarville. He enjoyed a happy childhood as the four McCarville ‘poor boys’ learned about life on the farm. Harold enlisted into the Army Air Corp in 1945 and served in Guam as a cryptographer. Upon his discharge from the service, he enrolled at the Iowa State Teachers College (now Northern Iowa University) and received a bachelors degree making use of the benefits received from the G.I. Bill. Harold taught for three years in Newhall, Iowa and Fort Atkinson, Iowa before entering the business world in 1952. He worked at DICO Corporation in Des Moines for 38 years, initially as an accountant before retiring in 1990 as the Secretary Treasurer. Upon retirement Harold devoted much of his time to genealogy, serving as the McCarville family historian for many years. He also enjoyed travelling with his wife Dorothy, attending family reunions, spending winters in Arizona and visiting their children and grand-children. Harold volunteered for many years assisting people with insurance issues under the Senior Health Insurance Information Program (SHIIP). He also volunteered with the Iowa Genealogical Society and the Iowa Historical Society. Over the years Harold and Dorothy made many friends with the Merle Hay Mall walkers. Harold was preceded in death by his wife of 64 years, Dorothy Zeller McCarville, parents, Raphael and Hazel McCarville, and brothers Irvin McCarville and Gerald McCarville. He is survived by his brother, Charles McCarville (wife Ardith), sisters-in-law Marion McCarville and Sherry McCarville, children Patricia (Charles) Ryen of Springfield, Missouri, David (JoAnn) McCarville of Palatine, Illinois, Mark (Sally) McCarville of Shoreview, Minnesota, Susan Dunsky of Des Moines and Douglas (Miriam) McCarville of Orcas Island, Washington, grandchildren Anthony A Dunsky, Shaunda Bradley, Chad McCarville, Katherine Metzel, Christopher Ryen, Alison Wolfe, Daniel McCarville, Kirsten Rinker and Dania Rinker, great grand-children Anthony J Dunsky, Nolan Ryen, Adele Metzel, Sophia Bradley, Aidan Ryen, Jackson Ryen, Charles Metzel, Sadie Bradley, Carlie Jo Dunsky and Max Wolfe and many nieces, nephews and cousins. The McCarville children appreciate the wonderful help that his assistant, Bonnie Fry, provided Harold during the last few years. Also, many thanks to the kind people at the Iowa Jewish Life Center and the Hospice of the Midwest that provided Harold with much comfort during his final days. Condolences may be left at caldwellparrish.com. To send flowers or a remembrance gift to the family of Harold McCarville, please visit our Tribute Store. "Email Address" would like to share the life celebration of Harold McCarville. Click on the "link" to go to share a favorite memory or leave a condolence message for the family.